If you played, coached, or spectated little league baseball or watched Ferris Bueller’s Day Off, then you’re familiar with the age-old, friendly taunt of “Hey batta batta batta batta, sa-wing battaaaa.” During early morning Halloween hours, the Bank of Japan(BOJ) provided the treat of all Halloween-day treats for speculators around the world. 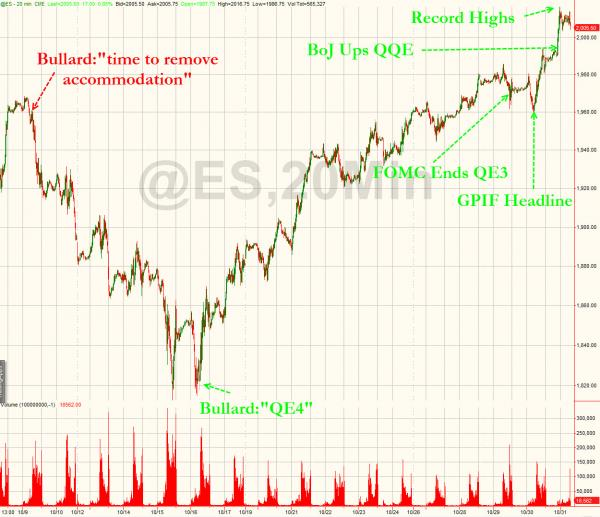 They announced additional quantitative easing that set the stock markets around the world on FIYA! 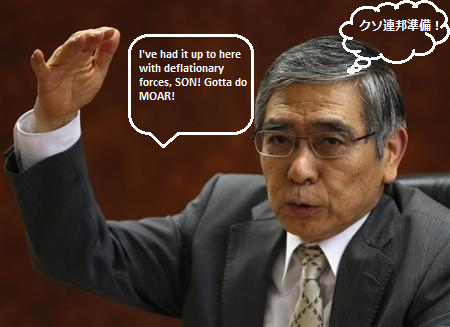 BOJ Governor Kuroda went and grabbed the 50oz special big-boy bat and took a monster swing at deflationary forces. What a miraculously well timed announcement on the heels of the Federal Reserve reiterating the completion of its own QE program. Of course, the Fed’s not really wrapping up just yet as it will continue to roll as opposed to liquidate the assets it has purchased over the last 5 years. The Nikkei’s intraday move was over 4%. Most of the major indexes around the world gained over a percent today thanks to the “good” news. Japan’s central bank will be upping its bond asset purchases to $60B(all numbers in this post are in USD) a month or $730B annually. The US dollar amount will fluctuate as the Yen weakens against it, however the BOJ will keep steady at about $6.7 trillion yen a month. They claim that the move is temporary until inflation targets have been sufficiently met. Yeah, about that temporary thing? Along with the bond purchase announcement, the BOJ also stated that they’ll be buying up Japanese ETFs and REITs to the tune of almost $7 billion and $1 billion a year, respectively. That’s a lot of dough to be tossing around and my guess is that it’ll drive enough positive sentiment that from a political standpoint, nobody’s going to want to sign off on terminating the purchases. Imagine the negative perception along with a move down in animal spirits. As they say in Jersey, dey don’t want nuttin ta’doo wit dat. Additionally, the BOJ coordinated the announcement with the Government Pension and Investment Fund of Japan (GPIF), the largest pension entity in the world, which 1 day earlier stated they would be upping their own stock purchase program. Specifically, the GPIF announced it was paring back its Japanese debt holdings from 60% of its portfolio to only 35%. An unheard of allocation choice for a pension entity considering the lack of conservatism. They might as well have said “we’re all in on stocks.” They’ll be doubling their equity exposure to 50% of the portfolio. Rational economic thought behind these massive moves is how will the unintended consequences manifest themselves down the road? Kuroda, like all central bankers, assures the public that they can control the inflationary forces that they so desperately desire. Maybe for a little bit. Maybe forever. Recall Kyle Bass’s thesis as the BOJ is walking a fine line. At this point in the game, it’s hard not to believe that central bankers really do have everything under control. This is despite the fact that monetary and economic policies in the advanced economies have no parallels in history, and in the short-term, things seem to be working out brilliantly on a statistical basis. It is difficult not to observe all the activity while thinking that the unintended, and most probably, uncontrollable consequences will be the ultimate arbiters of the societal value behind these unprecedented steps taken by the central banks of the westernized nations. In the meantime, enjoy the ride and the implacable rise in financial asset prices. Actually, in a November 2013 report, McKinsey stated the impact of ZIRP on asset prices is inconclusive. Specifically, they state, “…we find little evidence that ultra-low interest rate policies have boosted equity prices in the long term. In the United States, the evidence on whether action by the Federal Reserve has lifted the housing market is also unclear, because it is difficult to disaggregate the impact of these measures from other forces at work in the market.” That’s curious. One would think logically that there would be a direct correlation between record low mortgage rates and new home purchases. Combine that with a ridiculously low WACC for the biggest financial players and Americans said hello to their new landlords, yield-starved institutional investors and astute corporate vultures. It would also be logical to assume that when an entity can borrow at 1% and buy back its own stock yielding 2.5%, that there would be positive arbitrage opportunities. The fact that those opportunities lead to reduced share counts, increase earnings, and thus drive up stock prices has no correlation to ultra-low interest rates. 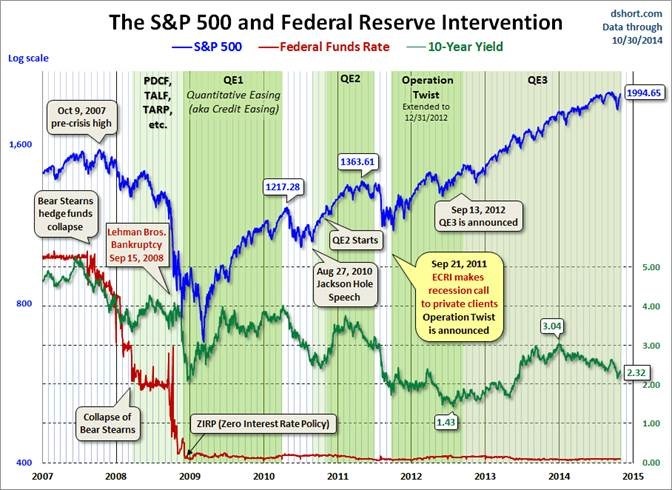 D-short presents a perfect illustration of the “low-correlation” effects of ZIRP and QE on the stock market. As I was saying, enjoy the ride. Buy every damn dip. Just buy and hold. Buy, buy, buy! In reality, I continue to think that raising cash levels due to a true lack of value across multiple sectors is prudent portfolio management. That doesn’t mean liquidate your portfolio. It just means that raising cash levels for potential bargains that avail themselves may prove more profitable than simply sitting in holdings that have already accumulated a very nice gain over the last few years. Look at the E&P’s off of oil’s slide. Myself, I don’t think we’re going to see an avalanche down to $30’s like we saw after the fall from the $150’s. Toe-dipping into the really well managed opportunities that possess prime shale or offshore acreage appears to be presenting quality value. Observe the P&C insurance players as well. They held up remarkably well in the most recent sell-off and continue to report tremendous profitability, however, in the face of a softening price cycle. Just be careful. If you think momentum ignition and government intervention(jawbone or real) are fictional notions that don’t affect volatility, then have a look at this ZH chart. Coming back to our little baseball reference, America was the 3rd and most valuable batter in this game of QE. Japan is hitting clean-up and protecting America’s own aggressive batting strategy. At some point, the 5th man in the lineup needs to show his power capabilities as well and drive in some runs. That 5th batter is Europe and Draghi is wielding the bat. If the game of central banks is to continue unimpeded, then he needs to put down the 36oz timber and go get his own corked 50oz bat to stave off deflationary forces in Europe. That damn German 3rd base coach keeps getting in the way though and giving the signal to sacrifice bunt. Lastly, if you have kids, then take them to the wealthy neighborhoods to fill their bags full of candy. If you’re at home and not trick or treating, then give out the giant sized candy bars. You’ll be loved by the neighborhood children. If you’re in your 20’s and single, then go party it up with all the Halloween hotties(female or male) dressed to impress tonight…and be safe. Happy Halloween readers!